Amazon.com has promised to make a paid app free every day in the Amazon Appstore, and today's app is BubbleMech. Can you halt an alien infestation of your precious bubble supply? 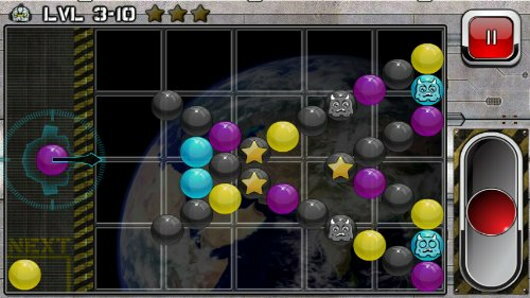 Find out in BubbleMech, an Android game that advances the evolution of classic bubble-shooter challenges to a new level. BubbleMech proves that few things are more fun than bursting bubbles--especially when you're eradicating pesky, infectious aliens at the same time. Do you have what it takes to fend them off? An alien bug infestation is spreading through your ship's bubble supply. Your job is to stop the outbreak by bursting all the infected bubbles on each level, collecting bonus stars along the way. To burst bubbles, shoot them into clusters of three or more of the same color. But you'll have to hurry--the bugs are spreading quickly, and more bubbles are pouring in every moment. BubbleMech features 80 specially-designed Arcade levels and 10 Battle tournaments. In Arcade mode, you'll complete each level by bursting infected bubbles and collecting stars. Battle mode ramps up the drama and pits you against the computer in turn-based tournament arenas. As you play, keep an eye out for essential power-ups and bonus star achievements. The game's one-touch control system makes aiming and shooting simple, and there's even an easy-to-follow tutorial to get you started.